Last night I went to the very successful mallowstreet 2012 Awards bash near London Bridge. Mallowstreet is a pension social media site which I became a member via the AMNT. 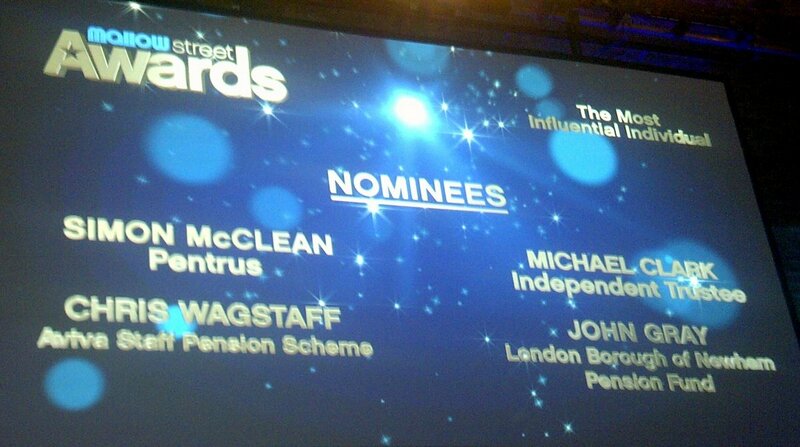 I was up for "the most influential trustee award". There is a little bit of flannel being nominated in these sort of awards but its nice flannel. Chris Wagstaff from Aviva Staff Pension Scheme deservedly took the award but I had a very good evening and on our table we put the pension world to rights around the possible consolidation of funds and investment in affordable housing. I was tweeting during the evening and everyone's tweets on the hashtag #msawards were shown on screens around the hall. I was asked what my twitter "avatar" (picture on my account) was about? I explained that I had put on it a poster for the TUC "March for a Future that Works" on 20 October (see top of this blog). Stunned silence. Perhaps I should suggest that mallowstreet organises a City pension contingency to take part in demo on 20 October? They could march behind a Keynesian banner which said "let us spend ourselves into prosperity". They could also chant "what do we want: Infrastructure spending now!"